This week saw the most extraordinary scene materialize in Washington DC. 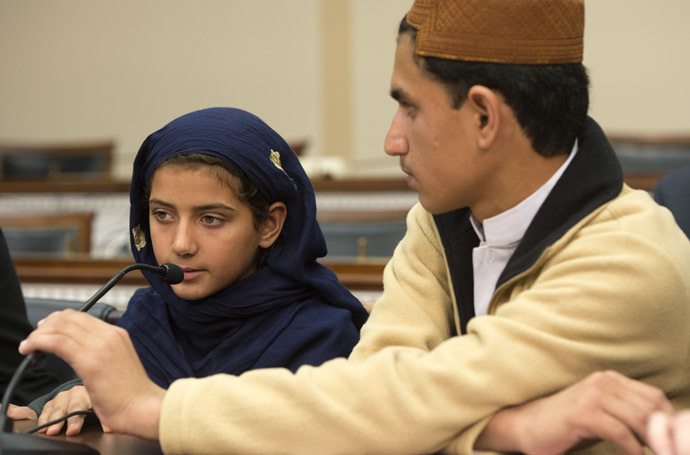 Nine-year-old Nabeela ur Rehman, from North Waziristan in the remote tribal region of Pakistan, arrived to a media blitz. She came to tell her own personal story to the nation, in front of the US Congress and national media, of drone horrors and the savagery of America’s secret assassinations overseas. Accompanied by her family, Nabeela told the story of the day her grandmother, a 67-year-old midwife, was killed by a US drone strike while tending her garden. There is talk of financial compensation being awarded to the family, which US officials are keen to avoid because of the flood of claims which might follow even one single, official admission of guilt on their part. Almost certainly, someone, somewhere is setting up a special new ‘NGO’ to handle US drone compensation funds should they ever be awarded. 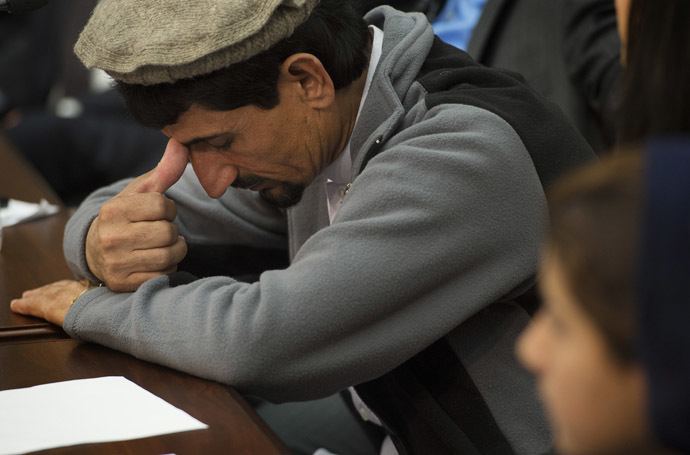 But direct payouts to victims might upset certain Pakistani officials, as such restitution would bypass the main financial beneficiary of US counterterrorism policy in Pakistan – corrupt factions within the Pakistani security services and military who’ve already received billions is US dollars over the last decade in order to assist Washington in its famous War on Terror. Notice how there has never been any serious diplomatic rift between Pakistan and Washington, even though Pakistani officials now admit that at least 67 innocent civilians have been killed by US drones since 2008. One UN investigator puts the number at 400 since 2004. Some human rights groups put the number even higher. To date, the White House’s party line on its clandestine, unmanned air force has been strict denial of civilian casualties, followed by sweeping legal statements made to exonerate any wrongdoing on its part. But it will take more than political dexterity for the White House to talk their way out of this case. For both American and overseas voices alike, a serious conversation over the criminality of US drone policies is long overdue. Maybe it will take the honesty of a nine-year-old girl to break down the flaky arrogance of salaried apologists in Washington. Through war powers enshrined in the National Defense Authorization Act(NDAA) and revelations leaked from a confidential Justice Department memo, the US government has been on the biggest extrajudicial killing spree of our time. For the last two US administrations, Washington officials have insisted that they are ‘covered’ legally by ordering the killing of any suspected Al-Qaeda terrorists, and even American citizens, as long as a handful of individuals somewhere within the US intelligence establishment believe they might present a threat in the future. Most notably here were the secret assassinations by the US of alleged Al-Qaeda operative Anwar Al-Awlaki and his 16-year-old son -both of whom were US citizens. This was significant because it set a precedent, giving Washington the power of life and death over any US citizen, anywhere on the planet, completely without due process. Similar statements you’d expect from Himmler’s press office when inquiring about forced labour camps. Hence, any lawsuit or meaningful government inquiry into the US drone program has hit a brick wall. For the US government, framing the sales pitch for drone warfare is perhaps more important than the actual missions they are meant to carry out. What started out as an easy sell has since become a hot debate. The correct technical name for a ‘drone’ is an Unmanned Aerial Vehicle (UAV). Drones were sold first to the American electorate as a type of aspirational product – one that would prevent US soldiers’ lives from being put in harm’s way. For a PR-conscious Bush administration in Washington DC, this was seen as a ‘no-brainer’ that addressed the focal point of the public’s backlash against both wars being staged. Their big public debut came circa 2004-2005, during operations ‘Task Force Liberty’ in Afghanistan and operations ‘Enduring Freedom’ and‘Iraqi Freedom.’ Since then, the visibility of military and police drones has literally cascaded in the media, as well as become a protagonist in countless Hollywood productions and popular video games. Backed behind the scenes by then-White House counterterrorism adviserJohn O. Brennan, President Obama took to the technology like a duck to water. From late 2009, he began escalating attacks using unmanned Predator drones against Taliban and Al-Qaeda targets in Afghanistan andPakistani tribal areas along the formerly out-of-bounds border region between the two countries. The moral back-stop put in place by the Obama White House has turned out to be a lot more flimsy than the façade of self-confident, official statements delivered by in-house, White House news anchors Jay Carney and Robert Gibbs. The percentage figure of ‘militants’ the CIA or the Pentagon claim to have killed in their daring drone raids into Pakistan and Yemen does not necessarily square with the facts on the ground. US officials claim to have killed 2,160 ‘militants’ during the period of 2008-2013, and as per usual, the public is expected to simply take the Pentagon or the CIA’s word regarding how many actual ‘militants’ or ‘Al-Qaeda operatives’ were killed on any occasion. Aside from the fact that it’s not at all in America’s legal or political interest to ever admit that an innocent person was killed during a drone strike, the public is well aware by now that it is common practice for their government to cover up any military escapades that would paint a war in a negative light. Add to this that the press is being overly shy about challenging Obama the way the previous administration was challenged regarding highly illegal and undeclared wars, and you have a perfect storm for a drone program which has spun out of control. The reality behind the proliferation of drones and their use, first overseas and later on the domestic front, is not so much a government-driven effort as it is a corporate one. US companies have also leaned heavily on specific congressman and senators for the adoption of drones by promising thousands of jobs in their respective states. Through their access to the Pentagon via Capitol Hill, military contractor giants like Northrop Grumman, Lockheed Martin, Boeing, and General Atomics have lobbied hard for their new products to be adopted as a central part of the US military industrial complex, and have seen their sales jump to over $5 billion in only a few years since modern prototypes have been launched. US manufacturers have a global market share of around 70 percent of the UAV market, and their flagship products – the Global Hawk, Reaper, and Predator/Mariner models – dominate US drone fleets across all branches of the military. UAV technology is not new at all. They were first used for basic surveillance behind the Viet Cong line during the Vietnam War in the late 1960’s, and were nicknamed ‘drones’ because of the repetitive nature of their deployment. The technology today is staggering. To simply call them drones is to downplay what they are actually capable of. Some advanced models today are capable of hypersonic speeds (Mach 5+) cruising at 50,000 feet. Other advanced prototypes have not been widely publicized, but include development on models that can cruise at low Earth orbit and reach speeds of Mach 25. Whereas today’s drones are manned remotely by a human military operator stationed deep inside the US on a base in Nevada, or closer to the conflict theatre from the US CENTCOM base in Qatar, or from the US AFRICOM station in Djibouti, East Africa, tomorrow’s drones may not be controlled by humans at all. Defense contractors are already in the advanced stages of implementing artificial intelligence (AI) control of unmanned fleets, in what they are labeling ‘Autonomous Intelligence Systems.’ Reading its own data of heat signatures, and with additional visual and location data, the computer will be tasked with making the value judgment about which targets are ‘high value’ and which ones will be spared. Quite simply, AI is a technocrat’s dream. Just as war-shy politicians in Washington embraced the use of drones because it distanced them from having to answer for dead US troops coming home in body bags, the prospect of a new wave of AI drones will most certainly be welcome by today’s political invertebrates. Why? Because it gives politicians what they have been craving for generations: the ultimate legal out – the ability to devolve responsibility for killing other humans to a machine. If this sounds like outrageous dystopic science fiction for some, just consider how the progression of this technology has already moved forward in political circles on its ‘ethical’ merits. It’s rather sad that it might end up being down to the courage of a nine-year-old in order to wake Americans out of their intellectual slumber regarding the clear and present danger that drones pose to individuals’ personal security everywhere. The genie is already out of the bottle, and very soon, it will be too late to put it back in. More the reason to regulate the proliferation of this industry now, rather than later.